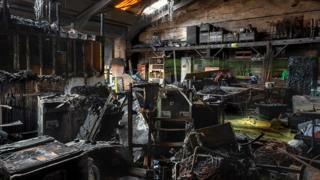 Police are hunting arsonists who started a fire which devastated a workshop that creates artwork for the annual Manchester Day parade. It broke out at a Salford production workshop for arts company Walk the Plank at about 23:00 BST on Friday. The company said no-one was in the building and no-one was hurt, and summer shows would carry on "business as usual". Police believe the fire on Cobden Street was started deliberately. John Wassell, Walk the Plank co-founder, said staff were "saddened and devastated by this act of vandalism less than a year into our new home". "In the short term, we will be looking at alternative arrangements for our production workshops but I would like to reassure everyone that the shows will go on," he said. Summer shows, including In the Dholdrums Mela show, are expected to go ahead in London, Luton, Manchester and Newcastle. Last year, the group suffered another setback when one of its boats was taken from their base and dumped on a street in Manchester.